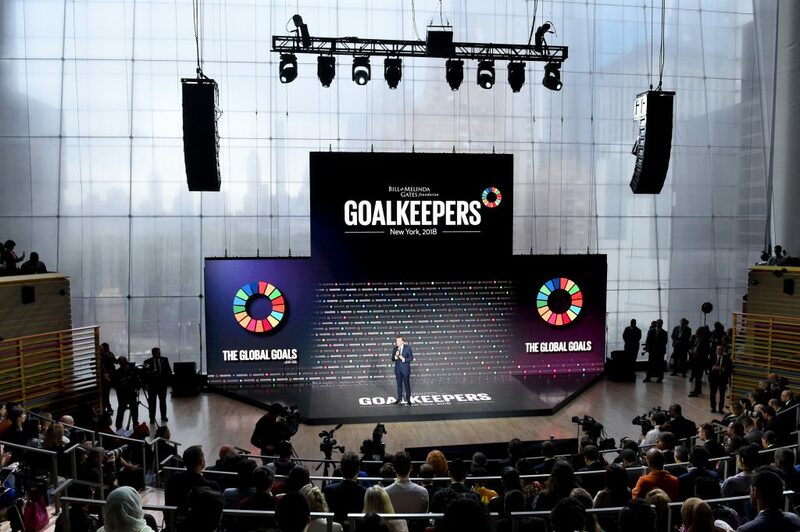 (November 27, 2018) – The Annual Goalkeepers event from the Bill & Melinda Gates Foundation recently took place during Global Goals Week 2018, a collective effort by various groups to leverage the opening of the 73rd session of the UN General Assembly in New York City and focus on driving progress toward the world’s Sustainable Development Goals (also known as Global Goals). This year’s guests included French President Emmanuel Macron, Sierra Leone’s President and its first Chief Innovation Officer, International Rescue Committee President David Miliband, and activist and widow of Nelson Mandela, Graca Machel. WorldStage, the in-house AV provider at Jazz at Lincoln Center, provided AV support to Empire Entertainment Inc. for the Goalkeepers awards ceremony and daytime event. Empire Entertainment was the executive producer and production company for Goalkeepers 2018. Empire worked with Project Everyone, co-founder with the Gates Foundation, of the Goalkeepers events, to devise the creative and technical design for this year’s program. “WorldStage came in early in the design process and worked with me to pitch the client on the technologies available that might work within the space,” says Matt Stevenson, Director of Production for Empire. An awards ceremony, honoring Global Goals advocates, launched the two-day Goalkeepers 2018 in the Rose Theater at Jazz at Lincoln Center. WorldStage provided the projection package for the ceremony, during which performances by Ed Sheeran, a 30-person choir, and Fatoumata Diawara punctuated speakers and awards giving. WorldStage also provided a disguise 4x4pro media server, For-A HVS-100 production video switcher, two Barco E2 frames for switching and signal management, and three Sony cameras. WorldStage furnished 12 channels of Shure Axient and Sennheiser wireless mics as well as sound support for the performers in conjunction with Jazz at Lincoln Center. This year the daytime event in the Appel Room featured an upstage 40×22-foot LED videowall comprised of customized, high-resolution c3ONE LED tiles, which offer the maximum in flexible configuration and dynamic design for indoor displays. The 3.1mm pitch of the LED tiles is the new standard for maximum resolution and reliability in the rental marketplace. “The c3ONE LED wall with its Brompton processing not only looked great to the audience it also looked wonderful on camera,” notes WorldStage Senior Account Executive Tony Rossello. “We also added our i5FLOOR, measuring approximately 12×20 feet, below the screen,” he says. WorldStage’s 5.2mm interactive LED floor system is one of the highest-resolution LED floors available on the rental market. WorldStage also deployed the disguise 4x4pro media server, For-A production switcher, Barco E2 frames and six Sony cameras that were positioned throughout the room and in the atrium. ISO and program records were done with Pix 270 decks; two graphic playbacks were also on hand. WorldStage fed the provided line cut of the event to encoders for webstreaming. On the audio side WorldStage supplied 24 channels of wireless mics featuring Sennheiser 5212 transmitters and 3732 receivers. Outside the Appel Room WorldStage fed live content and pre-recorded graphics and video content to existing displays at the venue, including a 4K LED videowall in the atrium and a Samsung monitor wall. WorldStage provided a Christie Spyder X20 for switching, a Dataton FX4 for 4K signal distribution and two iMac 4K retina displays for playback. At WorldStage Roy Hollier was the overseeing Project Manager and Joe Solari was Project Manager for the awards ceremony.